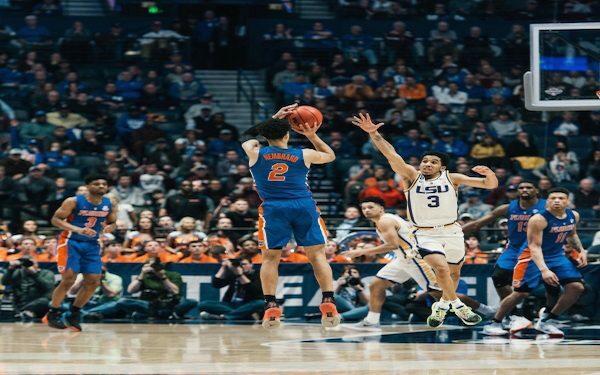 Aurora, Ontario’s Andrew Nembhard was one of the best passers in college basketball this past season and on Friday, April 12th he announced he would be entering his name into the NBA draft to gauge the interest of potential suitors. Not only was this announced by Nembhard but the godfather of NBA scoops Adrian Wojnarowki even commented on the Florida freshman’s announcement, a curious move considering he doesn’t often tweet about the draft entry decisions of players. Franchises are going to love Nembhard’s positional size as a 6’5” point guard. One of the advantages of that length is the fact he can see over defenses and create passing angles and he was able to pick apart college defenses with his vision. While he doesn’t possess elite speed his ability to push the ball in transition with a pinpoint outlet pass is perfect for the NBA and when he’s surrounded by athletic wings he could orchestrate a menacing attack off the break. The poise Nembhard plays with belies the fact he only just completed his freshman season of college and his ability to control pace is an intangible factor scouts would love about him. In the pick and roll heavy schemes of NBA basketball Nembhard would thrive and the spacing of a professional floor would unlock passing angles he doesn’t get to see in the condensed play of the college game. Vision isn’t something you can teach and Nembhard is gifted with the 6th sense of knowing where all 9 other players are on the floor at all times and while that doesn’t always instantly translate to stuffing the stat sheet he plays a winning brand of basketball that keeps the ball moving and gets his squad into their offensive sets. While he struggled to shoot off the dribble he was lethal as a catch and shoot player hitting 47.9% of his threes on those attempts and NBA teams up to snuff on their analytics will see a lot of potential there. The concerns teams will have with Nembhard are his athleticism and his ability to get his own shot. While his 6’5” frame is excellent for a point guard he isn’t an explosive athlete and defending speedy guards could be an issue. While he’s an intelligent defender who almost always found himself in the right position he struggled to contain some of the quicker guards in the SEC and scouts projecting his role in The Association are going to have some questions to ask there. Individual offensive creation is also not a strength of Nembhard’s and he’s not someone who is geared towards creating his own shot and getting a bucket. He didn’t shoot the ball well off the dribble this past year and while he became a much better finisher at the rim during the second half of the season than he was earlier in the year he still doesn’t have the explosiveness to project positively in that area. If Nembhard were to keep his name in the draft this year he could benefit from what I believe is a fairly weak class, particularly at the point guard spot. If he were to stay in college to smooth out his game he might find himself competing for draft positioning with a more talented position group and that could definitely weigh into his decision. A benefit of going back to Florida is that the team will be much improved from the past year and a more potent offense could help display Nembhard better than a team this season that didn’t have a lot of great finishers that could benefit from his surgical passing. The Gators return a good deal of their core while adding a 6th ranked recruiting class and they’re also in the mix for some of the most sought-after graduate transfers in the country, all signs that point to Nembhard being in a position to head up what should be a team making a deep run in March. The rules laid out that allow a player to enter his name into the draft to get feedback before making a decision are fantastic and Nembhard is wise to take advantage of them. Figuring out where he stands on big boards and hearing what teams would want to see him improve on is all valuable information and with what he hears he should be able to make the best decision for him and his family. Where Will Andrew Wiggins Land in the NBA Draft? Canada Advances to FIBA America Semi-Finals, Earn spot in U19 World Championship!